Organized in 1971, the Quit-Qui-Oc Men's Club hosts a full calendar of events, administers the handicap system at QQO, runs the Club championship, and encourages an atmosphere of fun and fellowship. New members are always welcome and must be sponsored by a current Men's Club member. The Quit Qui Oc Women's Club was started by a small group of women in 1991 who wanted to formalize the small existing calendar of events that was run in conjunction with the Quit-Qui-Oc Men's Club. The club's goal is to foster a love for the game through fun, yet competitive events. 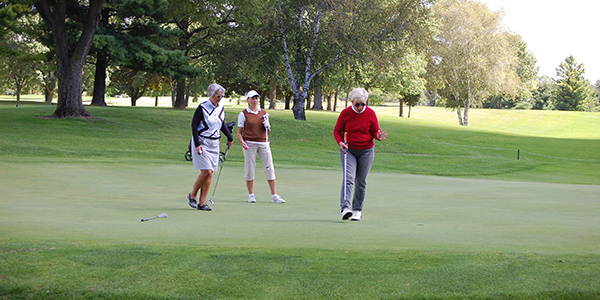 In addition, the women's Club administers the Women's Club Championship and Doubles Tournaments. An official USGA handicap is required for membership. The learn to golf program begins in early June. This fun program has a lesson component and on-course playing opportunities. While focusing on the basic skills for the beginning golfer, women of all ability levels will benefit from the Learn to Golf Program. Please call for more information. Cost: $60 registration fee, $15 weekly lesson fee. Only pay the weekly fee when you are able to attend.